In spite of American objections, The Philippines is continuing discussions with Russia regarding the purchase of submarines as part of President Rodrigo Duterte’s drive to modernise the Philippine navy. Since the initial US admonition of The Philippines for its talks with Russia, the US has formally invited The Philippine President for talks regarding the sale of US equipment which Washington promises is top quality. Duterte however has openly disagreed with several of the points the American side has made while he has also questioned Washington’s sincerity. “”I would like to remind America all of them…how sure (are they) that I will be able to get what I bought?”. Duterte also reiterated a previous criticism when he said that the US was selling The Philippines old, under-maintained and sub-par equipment. He again highlighted a lethal crash of a US helicopter that killed Filipino soldiers. “It’s very important to me. I owe it to my soldier. We bought six helicopters. They said, they’re refurbished, they were used by NATO. Apparently, they were overused. Three of the helicopters crashed, killing all my soldiers…now you are talking about procurement. Prove to me first that you are in utter good faith but I do not want to communicate with them”. “It’s hard for you to say we are friends. We are friends but remember we are friends because you made us a colony years ago. It was not a friendship agreed upon”. Duterte closed by saying that the US is attempting to sell overpriced F-16s to The Philippines when more cost effective helicopters and small planes are what is needed to fight jihadist and communist terror groups. While the Philippine President said he is prepared to meet with US officials to discuss military supplies, he has no plans to fly to the US to do so. The Philippines and the United States – Who needs who? Recent years have seen the US use ever more threatening language against countries with which it has disagreements. This is especially true regarding military hardware and beyond this, when the US believes it will lose out on potential sales to Russian suppliers, things can get incredibly heated can be witnessed in respect of both Turkey and India. Washington is currently putting pressure on both nations (but especially Turkey) not to buy Russian military hardware in the future. The Countering America’s Adversaries Through Sanctions Act (CAATSA) authorises Washington to level sanctions against any nation that continues to transact with Russia, Iran and the DPRK. In this sense, if The Philippines does purchase the submarines from Russia, the US could very easily sanction Manila. Interestingly, the letter sent from Washington directly to Duterte was not the kind of ultimatum one has come to expect from the US. Rather than lambaste Duterte for engaging in a positive early stage security partnership with Russia and rather than warming of sanctions, the letter spoke of a “special relationship” between the US and The Philippines while the rest of the letter read more like a sales brochure for US military hardware manufactures whose products were proudly declared as “peerless”. While the US remains a major trading partner with The Philippines, for the United States, The Philippines has always been more about its strategic location than about its economic potential. This is indeed one of the reasons why recent decades have seen little US interest in developing the civilian economy of The Philippines. The fact of the matter is that the US is content with a poor but politically stable Philippines in order to suit its regional interests which are aimed squarely against China. In this sense, one could argue that the powerful and wealthy United States actually needs The Philippines more than the militarily weak and economically developing Philippines needs the United States. While America no longer has bases on Philippine territory in its name as it does in Japan and South Korea, the US does have agreements with Manila that allow it to use many strategic Philippine naval and air bases as if they were American in all but name. It would be difficult to rapidly replace these treaty agreements with Manila in respect of acquiring a similar deal in another ASEAN member state. Furthermore, while China has overlooked the US influence on the Philippine armed forces because of a long history dating back to the colonial period, if the US were to try and effectively colonise Vietnamese military bases, China would see this as a direct provocation without any historic justifications while even some anti-Chinese Vietnamese nationalists might not want the US to “come back” in such a fashion after being so dramatically kicked out in 1975. As part of the wider US strategy to provoke China at both ends of the South China Sea, having access to The Philippines remains important and perhaps indispensable for the US military. Unlike his predecessors, President Duterte has mercilessly criticised the United States while also demonstrating that while he considers himself a friend to China, he is by no means hesitant in respect of criticising China. 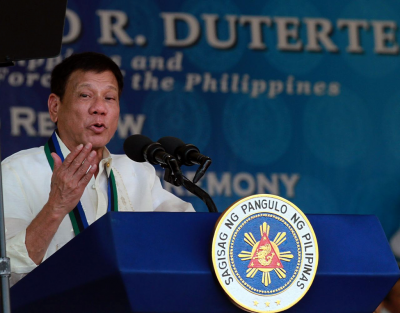 This 21st century non-alignment strategy of Duterte has clearly forced many nations to remain on their toes in respect of trying to guess what Duterte will do next, while his strong statements of criticism against the US colonial legacy clearly has Washington in damage control mode as the friendly letter sent to Duterte regarding weapons sales indicates. While some strong leaders such as Turkey’s President Erdogan, Russian President Putin and Chinese President Xi inspire contempt among many US policy makers, Duterte is clearly taken seriously even by those in the US who pretend otherwise. This is the case because Duterte has stated that he expects the US to behave in a neo-colonial manner and even expects the CIA to execute him. Because of this, Filipinos throughout the world are prepared for the worst and as a result of Duterte’s consistently strong popularity means that while a nation as powerful as the US could easily topple any Philippine government, if they did overthrow Duterte, the backlash could forever change Filipino perceptions of the United States in a holistically negative manner. Beyond this even if someone other than the US overthrew Duterte, because of his many warnings about the US, many millions of Filipinos would automatically blame the US for any regime change. This the US is clearly treading carefully, at least for the time being. Furthermore, Duterte’s openness to new partnerships means he is taken seriously by not only the Chinese and Russian superpowers but by great economic powers including Japan, Korea and fellow ASEAN members, while Duterte also looks to make a historic visit to the major weapons producer that is Israel in a matter of weeks. Because of this, it is clear that any nation which alienates Duterte will lose out on deals to which ever nation is on better terms with The Philippines. By having all of the major economic and military powers seeking better relationships with Manila, Duterte has transformed a colonial mentality into one where many nations are in a de-facto position of competing for partnerships with The Philippines. The United States has recently imposed punitive tariffs and sanctions against long time NATO ally Turkey while in the economic trade war few traditional partners have been spared whether South Korea, Japan all 28 states of the European Union, Canada, or Mexico. Thus far The Philippines has not be subject to these kinds of threats. In spite of Donald Trump having clearly positive sentiments about Duterte, when it comes to possible sanctions against The Philippines it is mainly a matter of the US doing a cost benefit analysis and bluff calling at the same time. Should the US impose sanctions against The Philippines, Duterte is the kind of leader who might just tell the US that it can no longer exercise usage rights over strategic military facilities in The Philippines. At such a point the US could either accept this and hope to exude economic pressure over an erstwhile “ally” or otherwise conduct a hybrid regime change operation – one that could backfire terribly on the US. Because Duterte has positioned himself in a position to attach multiple strong economic and military powers to The Philippines, the US risks losing the former colony for generations to come if it overreacts to Duterte’s desire to pursue dialogue with Russia over the submarine deal. In this sense, Duterte has been able to do what few leaders of more powerful countries have been able to get the United States to do – sit up, take notice and act cautiously rather than on impulse. Adam Garrie is Director at Eurasia future. He is a geo-political expert who can be frequently seen on RT’s flagship debate show CrossTalk as well as Press-TV’s flagship programme ‘The Debate’. Garrie has also commented on geopolitical events on international television and radio in the United States, Lebanon, Russia, Pakistan, Germany, Britain and Ecuador.A global specialist with an emphasis on Eurasian integration, Garrie’s articles have been published in the Oriental Review, Asia Times, Geopolitica Russia, the Tasnim News Agency, Global Research, RT’s Op-Edge, Global Village Space and others.